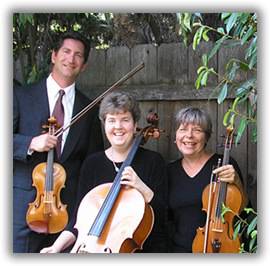 The Cascade Strings, three professional musicians from the Rogue Valley in southern Oregon, offer you beautiful live music to create a charming environment for your wedding or other special event. In addition to having played for hundreds of weddings and receptions, we have played for business grand openings, real estate open houses, birthday and office parties, and memorial services. We add "a touch of class" to any event! "We had many compliments from friends who enjoyed your music. We will certainly recommend you to anyone looking for great musicians!"